In a darkened room filled with boxes, we sit side-by-side and play. We talk. We laugh. We think. Time spent with my son is always a joyful, bonding experience. Sometimes it's outside, sometimes it's over a book, and sometimes it's with a game controller in our hands. We've played through every LEGO game together, we've carefully explored some of the edges of shooters. But as Tristan quickly approaches 10, his tastes increasingly seem to veer toward the immediacy of action-packed, fast-paced games. Fading are the days of gameplay as exploration, replaced by the gameplay of competition. So when Portal 2 arrived at our house I wasn't convinced it was the sort of game he'd like. While the notion of playing side-by-side with his dad on a single television remains appealing, the game's relatively methodical pacing, its lack of things to shoot, its push for lateral thinking, all seemed too much like work for a 10-year-old. But then I turned the game on. Tristan quickly became absorbed by the game's puzzles, the mocking GlaDOS. Tristan, an only child, was fascinated by the obvious robot favoritism inherent in the omniscient narrator. He quickly grasped the brain-twisting use of portal guns, understanding the notion of doorways that spin you, shoot you, absorb and project force fields, companion cubes and each other. And just as quickly he began to help figure out the puzzles that would have stumped me had I been alone on the couch. Where I find GLaDOS' manipulation through favoritism funny because it's so overt, Tristan finds it funny because it's subtle. This isn't a game that turns your child into a side-kick or power-up, this is a game that treats him as companion, a full-fledged member of the group. As one of two robots, Tristan is a required piece of the puzzle solving. 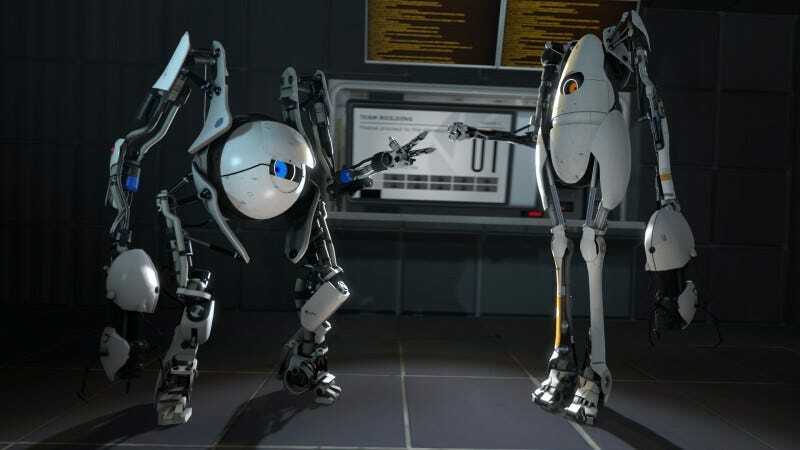 Portal 2 doesn't talk down to children who game, perhaps because it wasn't created for children who play. The gameplay, the tone, the story all seem to have found that magical place where parents and their children can have fun without being talked down to. It's a place home to LEGO bricks, NERF guns and Pixar movies. And now Valve. This morning, walking from the train to my office, my cell phone rang. It was Tristan, calling to say 'Hi' and then to hesitantly, nervously, ask if I would mind if he tried out Portal 2's campaign. Portal 2 may not teach him the strategy of fire from cover and health regeneration or the nuance of character buffing, but perhaps he'll learn how to think outside the box, to learn creativity and sound reasoning to solve the problems he will one day come to face... as long as they involve the occasional narbacular drop.